Home page | Techniques | Dental prosthetic mechanics facts | PMP: how can we reach aesthetics and function with attachments? (which represents about the 70% of combined prostheses cases) the right assembly of a couple of attachments (aesthetic-functional assembly) doesn’t allow them to be coaxial. With couple of coaxial attachments we mean that there must be a perfect correspondence of the virtual extension of the rotation centre of each attachment. The rotation movement of resilient attachments is functional while the one of rigid attachments is marginal. In a resilient solution the movement of the prosthesis causes a functional rotation around a consequent axis which will never correspond to the axis of the couple of assembled attachments. A big alignment discrepancy will cause a progressive structural tension which will negatively affect not only the attachments but also the old skeleton and on the pillar elements. We can make a good example to explain better this phenomenon comparing the resilient prosthesis, with attachments not aligned, with the door of an old “cellar” with a deformed jamb and with bent hinges. Both closing and opening, the door will have an irregular movement, it will be noisy and will force the hinges due to the tensions caused by a wrong alignment. So to “limit the damages” that this solicitation could cause, it is necessary, if you use resilient attachments, that they have also the horizontal movement (limited) that means that their patrices should have a freedom level able to allow a free direction)for example ART Micro Hinge with freedom level 2). 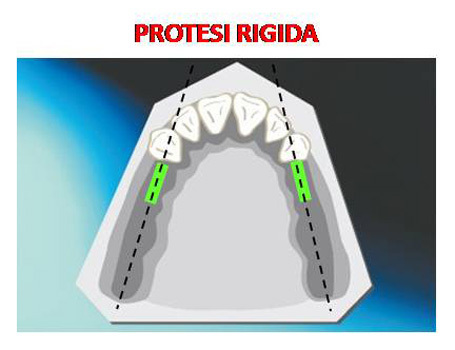 In a rigid solution, where the only significant movement between prosthesis and pillar is the elastic-structural one (which is usually marginal but not forgettable), the right procedure of attachments assembly will function perfectly, without troubles, if the simple suggestions written below will be observed. The word that better represents the right attachments assembly is: “Aesthetic-functional assembly”. - must be positioned in such a way to allow a dimensionally and morphologically right construction of the covering tooth. The respect of aesthetics, necessary for a right construction of the prosthesis, usually leads to the concurrent respect of functionality. With functional condition we mean a structural situation where all connexion devices are totally and efficiently involved, that is to say the condition where they can play functions of embrace, bearing and retention of the prosthesis. Use always the attachment with the BIGGEST DIMENSION AS POSSIBLE on the base of the available space and with the inclination in accordance with the gum ridge. Position the attachment with the matrix on the centre of the gum ridge and the patrix oriented according to the bi-dimensional direction of the ridge. The RESILIENT attachment is designed to function totally as indirect embrace and bearing and as retention. As consequence, in resilient connexion systems can only be used resilient attachments. The RIGID attachment is designed to function only partially as direct embrace and bearing of the prosthesis because its main function is to grant her an adequate retention. As consequence, in rigid connexion systems, which have to function totally as embrace, bearing and retention of the prosthesis, has to be used a rigid attachment combined with a milled custom made attachment realized with an milling machines. The guide connexions of traditional prefabricated attachments can be distinguished in three main geometrical shapes: trapezoidal (dove tail), cylindrical and rectangular. - Spherical connexion: the spherical connexion is not considered a guide because its vertical insertion path (the ray of the ball) is mathematically shorter than its horizontal dimension (the diameter of the ball). A statement is necessary: the connexion systems are defined guide systems when their vertical insertion path is longer than their maximum horizontal dimension. With burnout prefabricated attachments the geometry of the guide is often a combination of the three main shapes modified because casting techniques or automatic milling techniques cannot copy the edges.